Isis has carried out its largest mass killing this year, executing 33 people, according to a monitoring group. 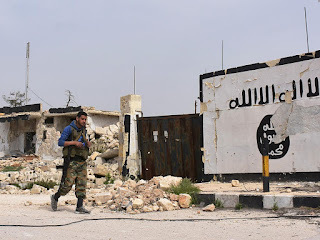 The terror group carried out mass execution in the al-Mayadin desert, near the strategic city of Deir Ezzor, the Britain-based Syrian Observatory for Human Rights reported. It said its activists were "able to monitor the execution and see the bodies". The report said 33 people aged 18 to 25 were "slaughtered by sharp tools" near a hole dug by the militants, which was "filled with blood". The Observatory said it was unknown whether those executed were Syrian government forces, allied militia or rebel fighters. US President Donald Trump has said the United States and its allies will destroy Isis and "protect civilization." "We will destroy Isis and we will protect civilization. We have no choice," Mr Trump said at a joint White House news conference with Jordan's King Abdullah. He said the king has been a leader in the fight to defeat Isis "once and for all". The military campaign against the group has been building slowly. More cities have been recaptured from the militants, and Isis has lost large swaths of territory in Iraq and Syria. However, the two biggest, climactic battles – to retake Mosul in Iraq, and Raqqa in Syria – have not been completed. Last year Iraqi military forces, supported by the coalition, waged successful battles to oust Isis from a string of cities in the run-up to the Mosul fight. Those included battles to take back eastern Mosul and the Iraq cities of Fallujah, Ramadi, and a number of smaller towns along the Tigris River. Backed by the coalition, the Iraqis were also able to defeat Isis at Makhmour and Qayyarah, enabling the military to establish bases at both locations and use them as logistical hubs for the battle to retake Mosul. However, no major cities have been retaken in the last six weeks. In February, Iraqi forces launched what is expected to be the last major battle against Isis in Iraq — the campaign to retake western Mosul. Success has been slower in Syria, where the US initially struggled to find a qualified cadre of local fighters to advise and train. Mr Trump is celebrated significant progress in recent weeks, as the US deployed hundreds more troops into Syria to help prepare local forces to retake Raqqa.